If you, a family member, or a person you support cannot meet all their communication needs with speech, it is worth considering AAC. AAC stands for augmentative and alternative communication. This term includes any tool or technique that replaces or clarifies natural speech. Many, but not all AAC systems are symbol-based. 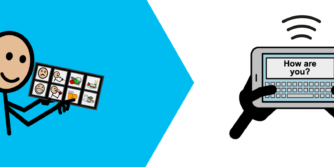 These symbol-based systems include pictures to support communication. 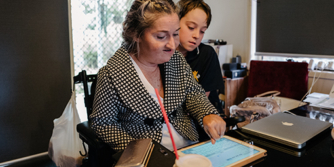 Many people who can read and write prefer to use text-based AAC systems. Using text-based AAC typically involves a combination of spelling and choosing pre-written messages. Most high-tech text-based AAC systems also include word prediction to speed up communication. 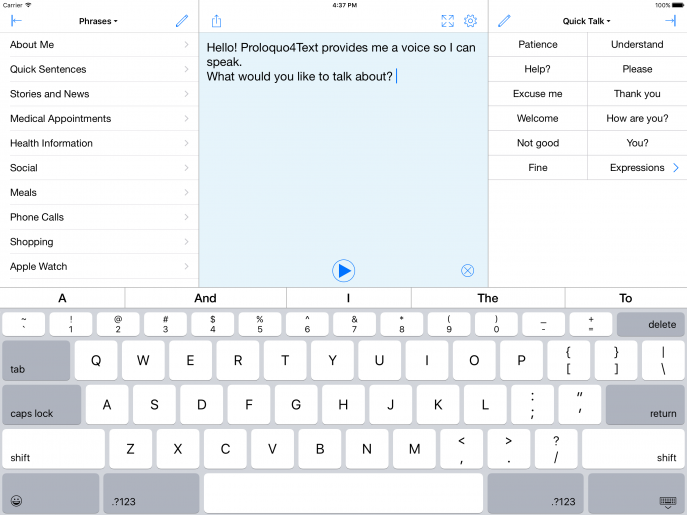 You can learn more about our text-based AAC solution at the Proloquo4Text product page. If you cannot reliably communicate everything you have to say using your own speech, you may want to consider AAC. AAC is not reserved just for people with no useful speech. In fact, the “augmentative” in AAC refers to using materials or techniques to supplement existing natural speech. “Alternative” refers to completely replacing natural speech, if it is not possible at all (Vanderheiden and Yoder, 1986). There are many reasons why people may need AAC. Many text-based AAC users have acquired or progressive conditions that result in loss of speech. Others may have lifelong disabilities that make it hard for new listeners to understand their speech. Some people who can usually speak fluently may sometimes lose speech. A completely text-based AAC system will likely work for most literate people. However, there are some people who can read and write very well and still find symbols useful sometimes. People who intermittently lose speech may be more likely to experience this. If you have trouble remembering words or reading when you lose speech, symbols may still be helpful. Some people may have trouble remembering certain phrases (like “that’s none of your business”) are an option. Sometimes, symbols can be a useful reminder of the power of these phrases. If this applies to you, you may want to consider a symbol-based AAC system. Most symbol-based systems also include a way to type messages. When transitioning, make sure to keep both the new text-based AAC system and older symbol-based system available, so the user can choose which to use when. You can read more about transitioning to text-based AAC in our blog post, Transitioning from symbols to text-based AAC. You can find guidance on supporting language development for users of symbol-based AAC systems in the Symbol-based AAC Learn section. If you or the person you support don’t need symbols, text-based AAC is often more efficient than using a symbol-based AAC system’s typing features. A good text-based AAC system has features that make communication as fast and efficient as possible. These include abbreviation expansion, word and sentence prediction, customizable phrase banks, and ways to save and return to ongoing conversations. It can often be helpful to have an evaluation with a speech-language pathologist (SLP) experienced in AAC. Often, conditions that disrupt speech also affect hand use and coordination. This can interfere with communication speed and accuracy or make certain types of AAC systems impossible to use. A knowledgeable AAC SLP can help you find the AAC system and access method that works best for you. It is important to check the background of the SLP you are considering working with. Some AAC SLPs primarily work with children with conditions like autism and childhood apraxia of speech. These SLPs may be less familiar with text-based systems and alternative access methods. You might not use your AAC system all the time. Or, you might mix high-tech and low-tech AAC methods depending on the situation and the people you are talking to. Sometimes, with people who already know you well, it can be faster to communicate many messages using speech or gestures. Or, you might find that talking with your husband or wife feels more intimate using a low-tech communication board. This is not a problem at all. The right way to use AAC is the way that works for you! Vanderheiden, G.C., & Yoder, D.E. (1986). Overview. In S. W. Blackstone (Ed. ), Augmentative communication: An introduction (pp. 1—28). Rockville, MD: American Speech-Language-Hearing Association.